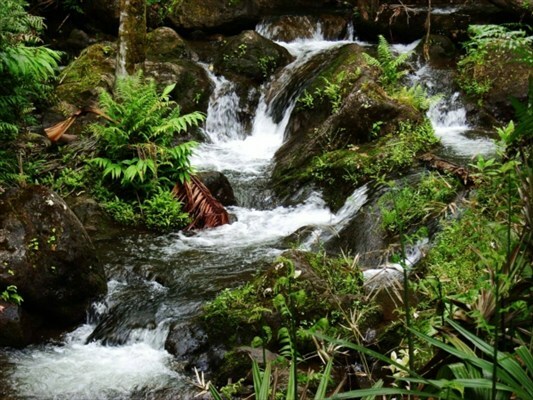 When people think of Hamakua properties they often think pastoral landscapes or oceanfront views, but there is a third alternative – that of enchanting rainforest retreat complete with waterfalls and a pool. Such is the case with one of my new east Hawaii property listings in Ninole (MLS# 256353). Stepping onto this 1.7-acre property is a feast for the senses — it’s like stepping into your own private tropical garden. Because the house sits atop Waiehu Stream, the first thing you notice looking out the three walls of floor-to-ceiling windows in the dining room is the lush landscaping on the surrounding hillsides. 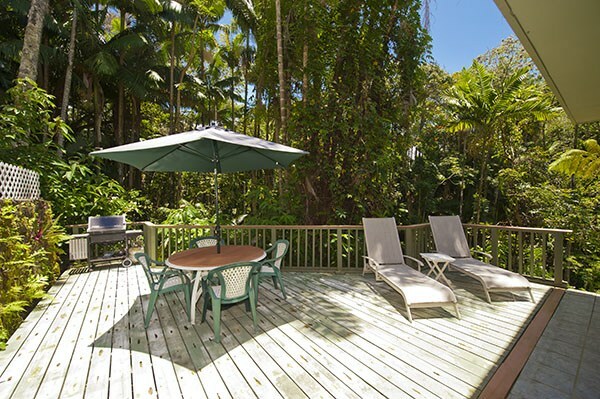 With hundreds of exotic palm trees, ferns, and flowering tropical plants you get the sense of living in the treetops. 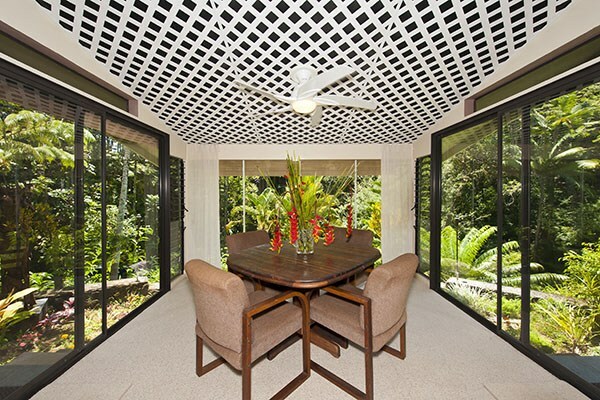 The feeling is one of seclusion and quiet, yet the property is close to Highway 19 and only 20 minutes by car from Hilo. While your eyes take in the luscious view, you hear the relaxing sounds of water tumbling over the waterfalls in the stream below. You can pick avocado, papaya, and bananas right from the tree for a tropical breakfast or an afternoon snack. You feel yourself relax as soon as you step into the 1,152 square-foot home with 3 bedrooms, an office, and 1.5 baths. Built in 1992, the home was designed by the engineer-owner and contains several thoughtful features that make the home as efficient as possible. For instance, eaves were built for the first and second stories enabling the house to “breathe”. Thus, the house has good airflow and doesn’t require the expense of air conditioning. The home was also designed with entertaining in mind — surround sound is built in throughout the first floor and the fully furnished kitchen features a drop-down counter that can be used as a buffet table. While the interior of the house is stylish — the best part is outside! There are two lanais off the back of the house overlooking the stream. The larger lanai contains a BBQ grill and is ideal for entertaining while the smaller lanai is perfect for intimate meals. 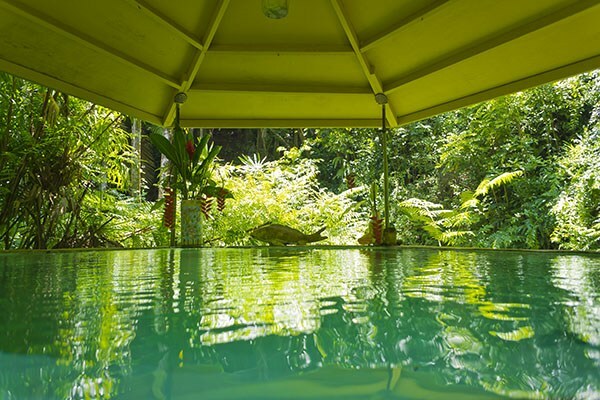 In between the two lanais is a hot tub offering stunning hilltop views. What makes the property exceptional is the secret found at the bottom of the stairs. Descend the steps from the lanai and you’ll find a concrete walkway through the forest that includes a charming covered pool. Although the pool is next to the stream, it’s spring-fed with fresh water and is self-cleaning by design. The 12,000+-gallon pool is also heated by solar power thus reducing energy costs. This home is perfect as a vacation rental or your own personal retreat. Property is turnkey, complete with a car in the covered garage and TMK 3-3-2-2-118 included. Give me a call today if you’re looking for your own private tropical paradise.